Galveston business owners told City Council Oct. 2 they hope the preliminary design for the corridor’s revitalization doesn’t use this concept map as a starting point. It’s only been a month since the City raised the ire of Galveston corridor business and property owners with a bridge closure that limited access to businesses and diverted traffic onto neighborhood streets. 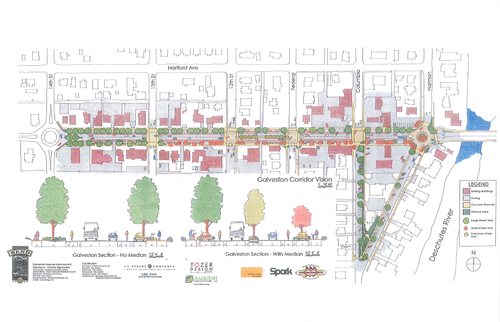 But last night, the Council approved, with the hesitant blessings of stakeholders, a contract to draft a preliminary design for the corridor’s revitalization. The design contract with HDR Engineering, which comes with a nearly $190,000 price tag, is the first official step in advancing the Galveston Corridor Improvement Vision — a collaboration between the Traffic Safety Advisory Committee and Galveston business owners that began in January 2011. Though that process was sparked by requests for improvements made by a group of property and business owners in 2010, some neighbors voiced skepticism about the current concept map and the potential impact of the nascent revitalization effort at the Oct. 2 meeting. He emphasized the importance of a preliminary design not using the concept plan map as a starting point. “Several issues were raised in the concept plan that pose serious problems for our business,” Gurule said, including plans for a mini-roundabout at the end of the bridge (and the bridge closure required to build it) and the removal of the left turn lane in center of street. He added that because the concept plan was drafted before plans for the OSU-Cascades campus or new NW Crossing developments were in the works, it fails to take into account their likely significant impact on traffic in the corridor. Westside Tavern owner Nicole Weathers added that the area business have been engaged in their own revitalization process for years, and wondered if the money might be better spent completing projects already in the works, such as finishing sidewalks. Councilor Doug Knight agreed and said he would want a minimalist plan to be considered. Transportation Safety Advisory Committee Chair Nick Arnis stressed that the project depends on the support of neighbors and businesses and would not move forward without a buy-in from the community. The Council voted 5-0 to approve the contract, with Councilor Mark Capell recusing himself because his brother works for HDR and Councilor Sally Russell recusing herself because she owns property in the Galveston corridor.